Why is Little Caesars Called Little Caesars? Home of the “Pizza! Pizza!” Little Caesars ranks third in the big pizza pie race, trailing Domino’s and Pizza Hut. Little Caesars is headquartered in Detroit, Michigan. Why is it Called Little Caesars? Mike and Marian Ilitch opened the first location of Little Caesars in 1959 in Garden City, Michigan. Marion’s nickname for Mike was “Little Caesar,” so she naturally suggested it when they were brainstorming ideas. “Pizza Treat” was the name Mike came up with, so they eventually compromised and called it “Little Caesars Pizza Treat.” However, Little Caesars soon became the official name of the pizza company. Though no one is really sure why Marian called Mike “Little Caesar,” the name still stands today, even after his passing in 2017. Little Caesars has not undergone any rebranding or renaming since it was first opened and there is no indication that fact will change anytime soon. Mike Ilitch was much more than co-founder of Little Caesars. Since his passing, many of his humanitarian efforts have begun to surface, including his connection to Rosa Parks. After some serious criminal incidents occurred, Ilitch paid Parks’ rent for 11 years, until her passing. This isn’t the only instance of generosity on Ilitch’s part. 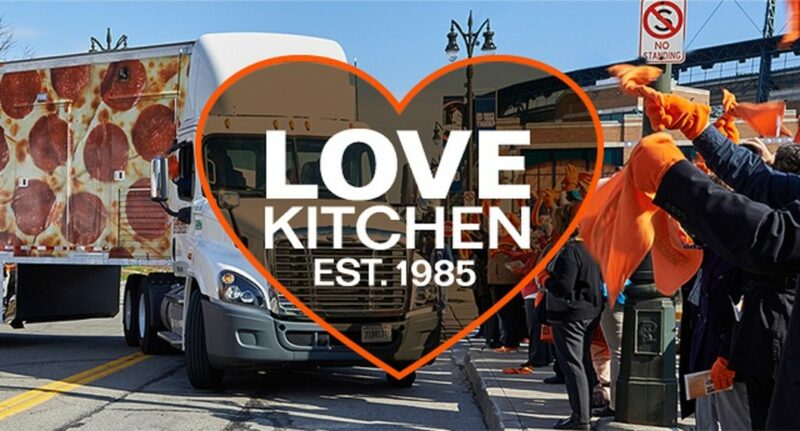 Little Caesars’ Love Kitchen is a mobile pizza-making-and-serving unit that travels to locations in need, whether the situation be a natural disaster or a state- or even nation-wide emergency. This famous Little Caesars saying goes hand-in-hand with the toga-wearing caricature. First coined in 1979, this phrase is actually younger than the logo itself—or should we say, himself. A friend of the founding couple, Don Silverstein, drew the pizza-eating man on a napkin in 1959, the very year the first restaurant opened. In the years since, Little Caesar’s character has undergone a few changes but overall, he has stayed the same. In fact, many have pointed out that like many logos of today, the tiny details on the toga spell out the initials “LC,” presumably for Little Caesars. One of the biggest differences between Little Caesars and the other big pizza chains boils down to delivery. Think about it: when was the last time you saw a Little Caesars dome sitting on top of a college kid’s car? CEO David Scrivano spoke directly to this distinguishing factor, confirming that delivery won’t be an option in the foreseeable future. Adding delivery options will effectively increase costs across the board, which will drive up prices as well. Because Little Caesars tends to serve to a lower-income demographic, adding delivery could potentially—and ironically—drive business away. Customers know that they can stop in to any location and pick up a pizza within a few minutes tops, so the gamble to stay with pick-up seems to have paid off. Fresh Pizza. Quick Pick-Up. Crazy Bread? The Daily Meal claims Little Caesars is the “only major national pizza chain that makes its dough fresh in-store daily.” That’s a lot of dough! It’s also a crucial component to the chain’s success, especially in a time when “fresh” is a hot-button topic. But did you know that you could potentially get a free order of Crazy Bread if you say, “Pizza! Pizza!” during your order? Have you given this trick a try? Let us know in the comments below!